It might not be much to look at, but Laetiporus sulphureus sure tastes good on a plate. A relatively common adornment to many a tree in Summer and early Autumn, the legendary Chicken of the Woods is one of the tastiest edible mushrooms found in the UK, and also one of the most highly prized: as the name suggests, it has the taste and texture of chicken, and its firm flesh makes an ideal substitute in stews, stroganoffs, curries, pilaffs and other meat dishes. 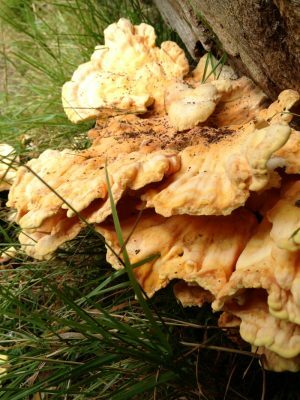 Easily overlooked by those not in the know, it is instantly recognisable to the gourmet fungi forager, and bares little resemblance to other poultry-named fungi like the Turkey Tail (Trametes versicolor) or the Hen of the Woods (Grifola frondosa), the Japanese delicacy known as maitake. 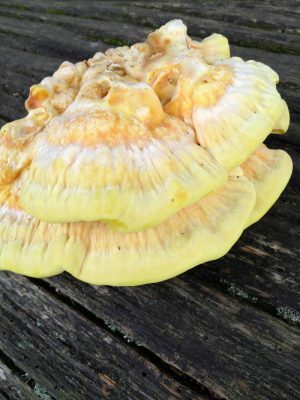 It is a bracket fungus that grows in large clusters of undulating fan-shaped shelves, the colour ranging from bright yellow to orange on its topside (hence the alternate common name Sulphur Shelf), with its yellowish underside pitted with pores from which it releases its spores and a firm white fleshy interior. Another identifier is that it also grows pretty large, typically around 10-50cm across, with each tier about 4cm thick, meaning that if you are lucky enough to stumble across one, you are sure to get at least one substantial meal out of it. I once found a prime specimen on a fallen tree next to a playground. Some kids, clearly unaware of its culinary potential, had kicked the bulk of it off the trunk. 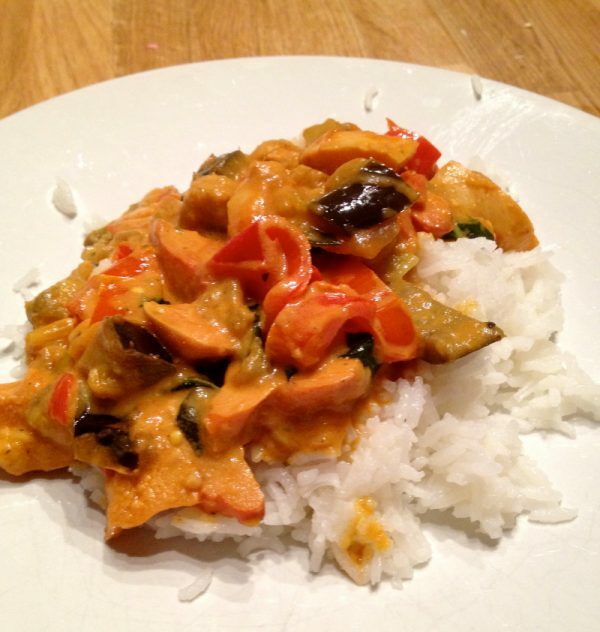 I took the remains home and transformed them into a memorable korma. The usual caveats apply here as with other wild mushroom foraging. First, take good note of the tree on which it is found. Eating any mushroom found growing on a yew, eucalyptus or cedar tree is to be avoided, as they can cause severe gastric upsets, nausea and dizziness due to the fungus absorbing toxins from the wood itself. Laetiporus sulphureus grows on a wide range of broad-leaved, hardwood trees, either living or decaying, although is most regularly found on oaks, chestnuts and willows. Its not dissimilar-looking close relations favour other hosts. For example, Laetiporus conifericola, as its name suggests, grows on conifers. 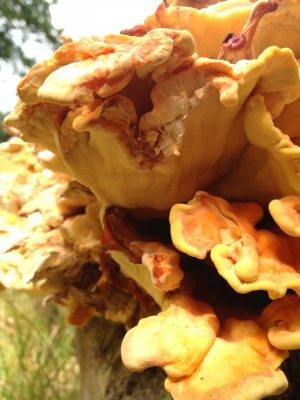 All species of Laetiporus are described as edible, so any toxicity is rooted in the tree itself. That said, individual reactions to mushrooms in general vary. Eugenia Bone, in her book Mycophilia: Revelations from the Weird World of Mushrooms, writes that “When I eat the bright orange chicken mushrooms (Laetiporus sulphureus and L. cincinnatus), my lips and tongue tingle in a freakily unpleasant way, a reaction some people have to an amino acid present in the mushroom.” The key when trying Chicken of the Woods for the first time is to stick with the young and fresh growths rather than the tougher ones noticeably past their first flush, and sample just a little at first to see how you get on. Secondly, the general guideline (vaguely enshrined in English law) is that no more than 1.5kg of any kind of mushroom should be taken from public land in any one visit, and picking for sale or commercial purposes is illegal. Certainly be aware of the bylaws of the area you might be foraging in, and never pick in sites of Special Scientific Interest. Picking any mushrooms is banned in Epping Forest, for example, and there have been some quite prominent prosecutions and fines imposed on those that have strayed from the path in recent years. As mushrooms are essentially the fruiting bodies of the fungus, with the organism primarily consisting of an expansive root system of mycelia in its given substrate, some would argue that picking them causes as much damage to the specimen as picking blackberries does to a bramble. Nevertheless, the law is the law. Actually, some would also argue that Laetiporus isn’t necessarily a welcome addition to any forest ecosystem. They are parasitic and cause a brown rot that will eventually hollow out the trunk of their host. Once discovered, they will reappear at the same spot year after year until the tree falls down. Nevertheless, Paul Stamets, in Mycelium Running: How Mushrooms Can Help Save the World, points out an upside to this, noting that as the species is never seen co-existing with other rot-inducing fungi like the Armillaria honey mushrooms, it could be used to prevent the migration of blights. Stamets also suggests certain medicinal benefits for humans, following on from research that extracts made from its mycelium strongly inhibit microbes including the staph bacteria (Staphylococcus aureus) responsible for skin and respiratory infections. 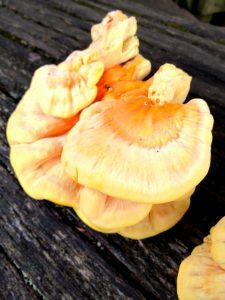 In summary, the Chicken of the Woods is a tasty and healthy addition to many a dish. Yes – it’s delicious, and it absorbs other flavours very well. Also, if you cut it into sizeable chunks, just as if it were chicken breast, it freezes beautifully, and you can enjoy a glut for months. Some people suggest cooking it in butter before freezing, but I’ve never bothered.